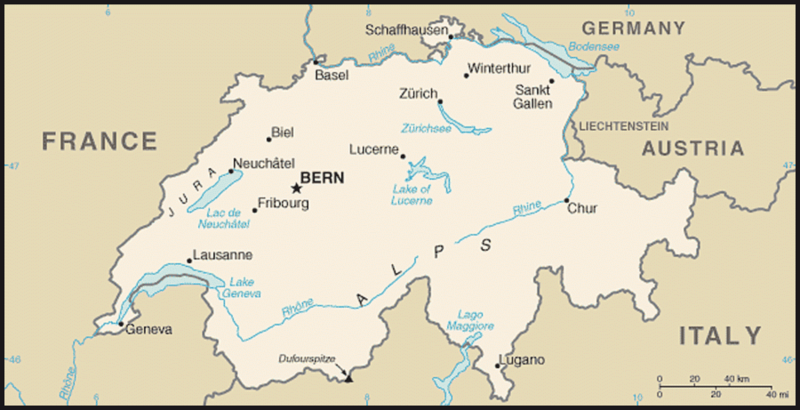 Cities: Capital: Bern (population 132,555 ). Other cities — Zurich (380,000), Geneva (190,000), Basel (190,000), Lausanne (127,000). Terrain: 40% mountains, the remainder hills and plateau. Switzerland straddles the central ranges of the Alps. Nationality: Noun and adjective: Swiss (singular and plural). Population (year-end 2010): 7.8 million. Languages: German 63.7%, French 20.4%, Italian 6.5%, Romansch 0.5%, other 8.9%. Education: Years compulsory: 9. Attendance — 100%. Literacy — 100%. Health: Infant mortality rate: 3.8/1,000. Life expectancy — men 80.2 years, women 84.6 years. Work force (4.7 million in third quarter 2011): Agriculture and forestry — 3.6%. Industry and construction — 23.1%. Services sector and government — 73.3%. Constitution: 1848; extensively amended in 1874; fully revised in 2000. Branches: Executive: Federal Council, a collegium of seven members, headed by a rotating 1-year presidency. Legislative — Federal Assembly (bicameral: Council of States, 46 members; National Council, 200 members). Judicial — Federal Tribunal. Political parties: Swiss People's Party (SVP), Social Democratic Party (SP), Free Democratic Party (FDP), Christian Democratic Party (CVP), Conservative Democratic Party (BDP), and several smaller parties representing localities or views from extreme left to extreme right. 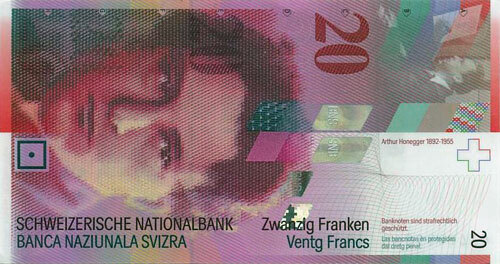 GDP (2010): $527.9 billion (467.8 billion Swiss francs [CHF]). Government expenses (in GDP%, 2010 est. ): 34.5% (federal, cantonal, and local). Annual growth rate (2011): 1.7%. Per capita income (2010 est. ): $67,078. Avg. inflation rate: 0.3% (2011 est. ); -0.9% (2012 est.). Agriculture (1% of GDP): Products: dairy (21%), livestock (25%), grains (4%), fruit and wine (10%), and vegetables (14%). Arable land (1999) — 26%. Industry (est. 29% of GDP): Types: machinery, chemicals, pharmaceuticals, time pieces, precision instruments, textiles and clothing, pigment, transportation equipment. Trade: Merchandise exports (2010): $195 billion (official exchange rate): food, beverages, and tobacco (4%; +8%); metal and chemical industries (44%; +10%); precision instruments (15%; +18%); watches (8%; +27%); machinery and electronics (22%; +12%); clothing (1.5%; -3%). Major markets — EU, United States, Canada, CIS, India, Brazil, Japan. Merchandise imports (2010) — $176 billion (official exchange rate): consumer goods (38%); equipment (19%); energy (7.1%); raw materials (28%). Major suppliers — EU, U.S., Canada, CIS, South Africa. Exchange rate (average 2011): $1 U.S. = 0.8861 CHF or SFr. Switzerland sits at the crossroads of several major European cultures, which have heavily influenced the country's languages and cultural practices. Switzerland has four official languages — German, French, Italian, and Romansch (based on Latin and spoken by a small minority in the Canton Graubunden). The German spoken is predominantly a Swiss dialect, but newspapers and some media broadcasts use High German. Many Swiss speak more than one language. English is widely spoken, especially among the university educated. More than 75% of the population lives in the central plain, which stretches between the Alps and the Jura Mountains and from Geneva in the southwest to the Rhine River and Lake Constance in the northeast. According to the Swiss Federal Office of Statistics, the population in Switzerland was 7,787,134 at year-end 2010 (up from 7,785,806 in 2009), of which 22% were resident foreigners and temporary foreign workers. The majority of this growth was attributable to net immigration, largely from the European Union (EU). Roughly 60% of the foreigners residing in Switzerland are from European Union member countries, while another 30% are from non-EU European countries. Almost all Swiss are literate. Switzerland's 12 universities enrolled 206,559 students in the academic year of 2011-2012, of which roughly one-fourth were foreigners. About 30% of the population aged 25-34 holds a diploma of higher learning. In the 2010-2011 academic year, 592 U.S. students were enrolled in Swiss universities. The Congress of Vienna in 1815 re-established the old confederation of sovereign states and enshrined Switzerland's status of permanent armed neutrality in international law. In 1848, after a brief civil war between Protestant liberals seeking a centralized national state and Catholic conservatives clinging to the old order, the majority of Swiss Cantons opted for a Federal State, modeled in part on the U.S. Constitution. The Swiss Constitution established a range of civic liberties and made far-reaching provisions to maintain cantonal autonomy to placate the vanquished Catholic minority. The Swiss amended their Constitution extensively in 1874, establishing federal responsibility for defense, trade, and legal matters, as well as introducing direct democracy by popular referendum. To this day, cantonal autonomy and referendum democracy remain trademarks of the Swiss polity. The Cold War enhanced the role of neutral Switzerland and offered the country a way out of its diplomatic isolation after World War II. Economically, Switzerland integrated itself into the American-led Western postwar order, but it remained reluctant to enter supranational bodies. Switzerland did not join the United Nations for many decades, even though Geneva became host to the UN's European headquarters and the country played an active role in many of the UN's specialized agencies. Switzerland also remained aloof in the face of European integration efforts, waiting until 1963 to join the Council of Europe. It still remains outside the European Union. Instead, Switzerland in 1960 helped form the European Free Trade Area, which did not strive for political union. Following the Cold War, Switzerland joined the Bretton Woods institutions in 1992 and finally became a member of the United Nations in 2002. 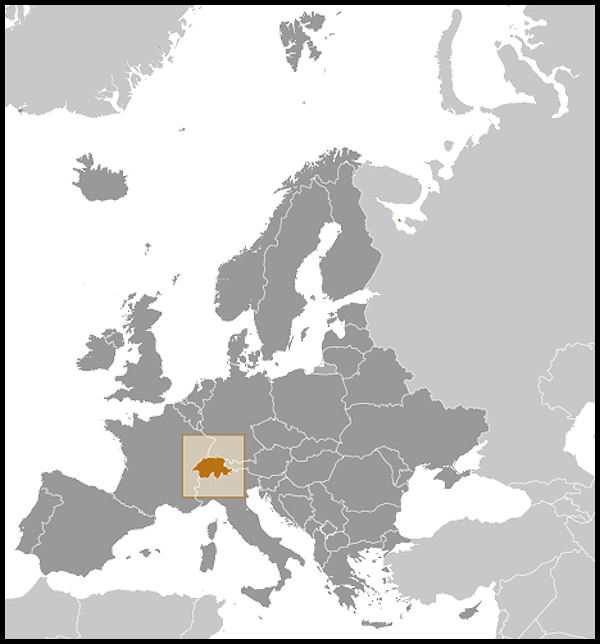 Switzerland is a federal state composed of 26 cantons (20 are "full" cantons and six "half" cantons for purposes of representation in the federal legislature) that retain attributes of sovereignty, such as fiscal autonomy and the right to manage internal cantonal affairs. Under the 2000 Constitution, cantons hold all powers not specifically delegated to the federation. Switzerland's federal institutions are:A bicameral legislature — the Federal Assembly;A collegial executive of seven members — the Federal Council; andA judiciary consisting of a regular court in Lausanne — the Federal Tribunal — and special military and administrative courts. The Federal Insurance Tribunal is an independent division of the Federal Tribunal that handles social security questions; its seat is in Lucerne. The Federal Criminal Court, located in Bellinzona, is the court of first instance for all criminal cases under federal jurisdiction. The Federal Assembly is the primary seat of power, although in practice the executive branch has been increasing its power at the expense of the legislative branch. The Federal Assembly has two houses — the Council of States and the National Council. These two houses have equal powers in all respects, including the right to introduce legislation. Legislation cannot be vetoed by the executive nor reviewed for constitutionality by the judiciary, but all laws (except the budget) can be reviewed by popular referendum before taking effect. The 46 members of the Council of States (two from each canton and one from each half canton) are directly elected in each canton by majority voting. The 200 members of the National Council are directly elected in each canton under a system of proportional representation. Members of both houses serve for 4 years. A strong emphasis on ballot votes arises out of the traditional Swiss belief that the will of the people is the final national authority. Every constitutional amendment adopted by parliament is automatically brought to the ballot and has to carry a double majority of votes and cantons in order to become effective. The voters themselves may actively seek changes to the Constitution by means of the popular initiative: 100,000 voters may with their signatures request a national vote on a proposed constitutional amendment. New federal legislation also is subject to popular review, under the so-called referendum: 50,000 signatures suffice to call a ballot vote on any federal law adopted by parliament. The Assembly can declare an act to be too urgent to allow time for popular consideration, but this is rare. At any rate, an act passed urgently must have a time limit and is later subject to the same constitutional provisions on popular review as other legislation. Under an arrangement between the four major parties called the "magic formula" which was introduced in 1959 but ended in December 2003, two Federal Councilors (ministers) were elected each from the Christian Democrats, the Social Democrats, and the Free Democrats and one from the Swiss People's Party. Starting in 2004, the party composition of the cabinet changed as a consequence of parliamentary election results and other political factors. The current party composition of the cabinet is: two Social Democrats, two Free Democrats, one Christian Democrat, one representative of the Conservative Democratic Party, and one representative of the Swiss People's Party. The Constitution requires that Federal Councilors act collectively in all matters, not as individual ministers or as representatives of their parties. Each Councilor heads one of seven federal departments and is responsible for preparing legislation pertaining to matters under its jurisdiction. The president, who remains responsible for the department he or she heads, has limited prerogatives and is first among equals. The administration of justice is primarily a cantonal function. The Federal Tribunal is limited in its jurisdiction. Its principal function is to hear appeals of civil and criminal cases. It also hears complaints of violations of the constitutional rights of citizens and has authority to review cantonal court decisions involving federal law as well as certain administrative rulings of federal departments. However, it has no power to review federal legislation for constitutionality. The Tribunal's 30 full-time and 30 part-time judges are elected by the Federal Assembly for 6-year terms. The Federal Criminal Court is the court of first instance for criminal cases involving organized and white-collar crime, money laundering, and corruption, which are under federal jurisdiction. The Court's 11 judges are elected by the Federal Assembly for 6-year terms. Switzerland maintains an embassy (http://www.eda.admin.ch/eda/en/home/reps/nameri/vusa/wasemb.html) in the United States at 2900 Cathedral Avenue NW, Washington, DC 20008. Consulates General are in Atlanta, Chicago, Los Angeles, New York, and San Francisco. Consulates are in Boston, Buffalo, Charlotte, Cleveland, Dallas, Denver, Detroit, Honolulu, Houston, Indianapolis, Kansas City, Las Vegas, Miami, Minneapolis, New Orleans, Oklahoma City, Orlando, Philadelphia, Phoenix, Pittsburg, Salt Lake City, San Juan, and Seattle. Switzerland has a stable government and a diverse society. Quadrennial national elections typically produce only marginal changes in party representation. In recent decades, Switzerland has seen a gradual shift in the party landscape. The rightist Swiss People's Party (SVP), which had traditionally been the junior partner in the four-party coalition government, almost tripled its share of the popular vote from 11% in 1987 to a peak of 29% in October 2007, thus overtaking its three major rivals. In the October 2011 elections, the SVP fell back to 26.6%, leading to 60 seats in both houses. The 2011 elections led to 57 seats for the Social Democrats (SP), 44 for the Christian Democrats (CVP), and 41 for the Free Democrats (FDP). The Green Liberals garnered 14 seats and the Conservative Democratic Party (CDP) 10 seats in both houses combined. On December 12, 2007, the center-left parliamentary caucuses refused to re-elect the SVP's Christoph Blocher (then-Justice Minister) to the Federal Council, and instead elected Eveline Widmer-Schlumpf, a SVP cantonal minister from Graubunden. As a result Eveline Widmer-Schlumpf was excluded from the SVP parliamentary caucus and joined the Conservative Democratic Party (CDP). On December 10, 2008, the SVP's Ueli Maurer was elected to the Federal Council and replaced former Federal Councilor Samuel Schmid (CDP) as defense minister. The Swiss economy increased by 2.7% in 2010; its growth was expected to slow to 1.7% for 2011 as a result of various factors such as an appreciating Swiss franc. However, due to successful government debt reduction (imposed by the so-called debt brake), Switzerland is not expected to be impacted by strict austerity measures imposed in other areas of Europe. Switzerland led the rankings of the World Economic Forum's Global Competitiveness Report 2011-2012, reflecting the country's sound institutional environment, excellent infrastructure, efficient markets, competent macroeconomic management, world-class educational attainment, and high levels of technological innovation, which boost Switzerland's competitiveness in the global economy. The country has a well-developed infrastructure for scientific research. Companies spend generously on research and development (R&D), and intellectual property protection is strong. Business activity benefits from a well-developed institutional framework, characterized by the rule of law, an efficient judicial system, and high levels of transparency and accountability within public institutions. Higher education and training are rapidly growing in importance as engines of productivity growth. Being a nation that depends on exports for economic growth, and due to the fact that it is so closely linked to the economies of Western Europe and the United States, Switzerland's economy mirrors slowdowns and growth spurts experienced in these countries. During most of the 1990s, the Swiss economy was Western Europe's weakest, with annual GDP growth averaging 0% between 1991 and 1997. Beginning in late 1997, the economy steadily gained momentum until peaking in 2000 with 3% growth in real terms. The economy returned to lackluster growth during 2001-2003, but began growing at or above potential since 2004 — 2.5% per annum — until the recent global economic crisis, which impacted Switzerland's growth. The year 2008 was marked by a worsening of the financial crisis and the beginning of its spread to the economy as a whole. Long-run economic growth is predicated on structural reforms. In order to maximize its economic potential, Switzerland will need to push through difficult agrarian and competition policy reforms. The economic upswing had some positive impact on the labor market, which has begun to fade due to the impact of the global financial crisis. Unemployment decreased from 4.1% in December 2003 to 1.5% in 2007, but was at 3.1% in November 2011. One-fourth of the country's full-time workers are unionized. In general, labor/management relations are good, mostly characterized by a willingness on both sides to settle disputes by negotiations rather than by labor action. Tourism, banking, engineering, and insurance are significant sectors of the economy and heavily influence the country's economic policies. Swiss trading companies have unique marketing expertise in many parts of the world, including Eastern Europe, the Far East, Africa, and the Middle East. Not only does Switzerland have a highly developed tourism infrastructure (making it a good market for tourism-related equipment and services), the Swiss also are intrepid travelers. Per capita, Switzerland is among the countries with the most visitors to the United States every year. In 2010, about 391,000 Swiss citizens came to the United States as tourists. Tourism is the most important U.S. export to Switzerland. The Swiss economy earns roughly half of its corporate earnings from the export industry. The EU is Switzerland's largest trading partner (59% of exports and 75% of imports in 2010), and economic and trade barriers between them are minimal. After more than 4 years of negotiations, an agreement known as the "Bilaterals I" covering seven sectors (research, public procurement, technical barriers to trade, agriculture, civil aviation, land transport, and the free movement of persons) entered into force on June 1, 2002. Switzerland has so far attempted to mitigate possible adverse effects of non-membership by conforming many of its regulations, standards, and practices to EU directives and norms. Full access to the Swiss market for the original 15 EU member states entered into force in June 2004, ending as a result the "national preference." The Swiss agreed to extend these preferences to the 10 new EU members on September 25, 2005, with restrictions remaining until 2011. A referendum was held in February 2009 on the Bilaterals I and the extension of the free movement of persons to Romania and Bulgaria. The Swiss Government embarked in July 2001 on a second round of bilateral negotiations with the EU known as "Bilaterals II." Talks focused on customs fraud, environment, statistics, trade in processed agricultural goods, media, the taxation of savings, and police/judicial cooperation (dubbed the Schengen-Dublin accords). Amid a fierce political debate over the essence of Swiss-EU relations and populist warnings against EU workers and criminals entering Switzerland, the Schengen-Dublin package was approved on June 5, 2005 by 54.6% of Swiss voters and entered into force on December 12, 2008. Fears of cheap labor coming from new EU member states have prompted the government to provide for tripartite surveillance committees to ensure that decent wages are enforced. The Swiss federal government remains deeply divided over EU membership as its long-term goal, and in a March 2001 referendum more than 70% of Swiss voters rejected rapid steps toward EU membership. 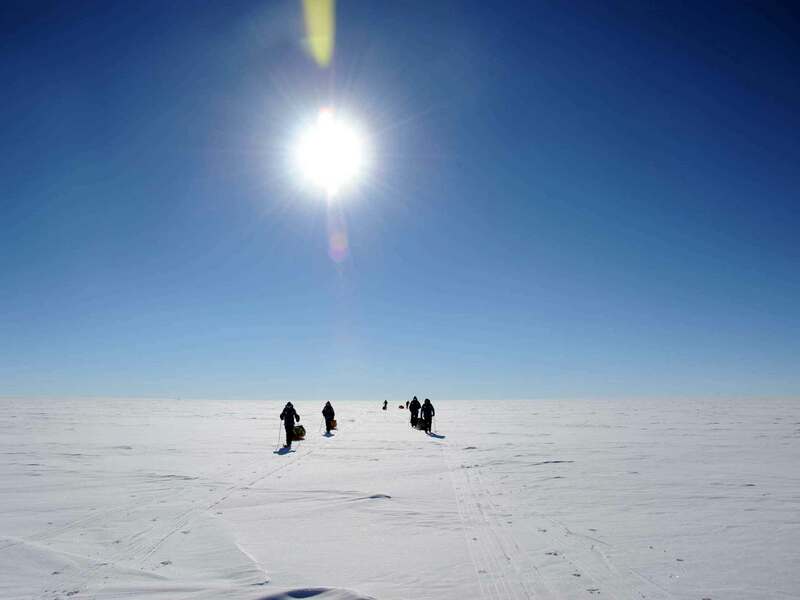 Switzerland nevertheless expressed interest in reaching a third layer of bilateral agreements that would involve energy, the Galileo satellite navigation system, health, and agriculture. But recent harsh criticism by the European Commission against preferential cantonal tax treatment for foreign holdings cooled the political climate with the EU. The government also agreed on June 25, 2008 to propose an amendment of the Federal Law on Technical Barriers to Trade to permit implementation of the EU "Cassis-de-Dijon" principle. Parliament adopted this provision and it entered into force on July 1, 2010. As adopted, all EU products can be imported into Switzerland without meeting the burdensome Swiss certification and Swiss languages requirements. Given that retail prices in Switzerland are frequently 20%-30% higher than in the EU, the Swiss Government believes that domestic prices could drop by 10% if EU products could be imported through streamlined Swiss procedures, but there are no official figures yet available showing whether such a decrease of prices has actually taken place. In 2010, Switzerland ranked 16th among the main U.S. export destinations, and 21st as a source of imports. The United States is the second-largest importer (9.75%) of Swiss goods after Germany (19.55%). In addition, the United States is the largest foreign investor in Switzerland, and conversely, the largest single destination of Swiss foreign investment. It is estimated that 300,000 American jobs depend on approximately $190 billion in Swiss investments in the United States. Switzerland has a militia army. The armed forces have a small nucleus of about 4,200 professional staff, half of whom are either instructors or staff officers, with the remainder mostly being facility guards. The army has virtually no full-time active combat units but is capable of full mobilization within 72 hours. Women may volunteer to serve in the armed forces and may now join all units, including combat troops; currently 1,050 women are active-duty members of the Swiss military. In 2011, the Swiss parliament decided to reduce the size of the Swiss army from 190,000 to 100,000 by 2014. The Federal Council also decided the same year to replace the Air Force's F-5 Tigers with 22 Gripen fighters from Saab, having decided against the Eurofighter and the Rafale. This decision could still become the subject of a referendum. Switzerland has been a Partnership for Peace (PfP) member since 2006. Switzerland has 220 military personnel deployed in support of KFOR peacekeeping operations in Kosovo. Switzerland also is a member of the following international organizations: World Trade Organization, Organization for Economic Cooperation and Development, European Free Trade Association, Bank for International Settlements, Council of Europe, and Organization for Security and Cooperation in Europe (OSCE). In 1992, Swiss voters approved membership in the Bretton Woods organizations but later that year rejected the European Economic Area agreement, which the government viewed as a first step toward EU membership. Switzerland also is an active participant in the major nonproliferation and export control regimes. The Swiss Constitution declares the preservation of Switzerland's independence and welfare as the supreme objective of Swiss foreign policy. Below this overarching goal, the Constitution sets five specific foreign policy objectives: further the peaceful coexistence of nations; promote respect for human rights, democracy, and the rule of law; promote Swiss economic interests abroad; alleviate need and poverty in the world; and the preservation of natural resources. Switzerland maintains diplomatic relations with almost all countries and historically has served as a neutral intermediary and host to major international treaty conferences. Since 1980, Switzerland has represented U.S. interests in Iran. In 2008, Switzerland agreed to represent Russia in Georgia as well as Georgia in Russia. Switzerland played a key role in mediating an agreement, signed in October 2009 in Zurich, to provide a framework for the normalization of relations between Armenia and Turkey. In 2011, Switzerland facilitated negotiations between Russia and Georgia, leading to Russian membership in the World Trade Organization. Switzerland (mainly Geneva) is home to many international governmental and nongovernmental organizations, including the International Committee of the Red Cross (whose flag is essentially the Swiss flag with colors reversed — the Red Cross historically being a Swiss organization). One of the first international organizations, the Universal Postal Union, is located in Bern. Under a series of treaties concluded after World War I, Switzerland assumed some responsibilities for the diplomatic and consular representation of Liechtenstein, the protection of its borders, and the regulation of its customs. Switzerland is a democratic country subscribing to the fundamental ideals with which the United States also is identified. The country is politically stable with a fundamentally strong economy. It has played an increasingly important role in supporting the spread of democratic institutions and values worldwide, as well as providing humanitarian relief and economic development assistance. U.S. policy toward Switzerland takes these factors into account and endeavors to cooperate with Switzerland to the extent consistent with Swiss neutrality. Cooperation under the U.S.-Swiss Joint Economic Commission (JEC) has invigorated bilateral ties by recording achievements in a number of areas, including consultations on anti-money laundering efforts, counterterrorism, and pharmaceutical regulatory cooperation; an e-government conference; and the re-establishment of the Fulbright student/cultural exchange program. The United States and Switzerland signed three new agreements in 2006, creating mechanisms that, in addition to the JEC, deepen our cooperation and improve our relationship: the Enhanced Political Cooperation Framework, the Trade and Investment Cooperation Forum, and the revised Operative Working Arrangement on Law Enforcement Cooperation on Counterterrorism. The centerpiece of the Enhanced Political Cooperation Framework is an annual senior-level meeting, the Joint Working Group (JWG). The first official U.S.-Swiss consular relations were established in the late 1820s. Diplomatic relations were established in 1853. The U.S. ambassador to Switzerland is also accredited to the Principality of Liechtenstein. The U.S. Embassy (http://bern.usembassy.gov/) in Switzerland is located at Sulgeneckstrasse 19, 3007 Bern, tel: (41) (31) 357-7011.